Malai kulfi made the good old fashioned way always takes me back to Wednesdays in my childhood. I’ll tell you why. Our school didn’t have the weekend off but we had holidays on Thursday and Sundays. Looking back, it was a rather strange arrangement but back then a mid week break was common practice for the schools in the neighbourhood. So, effectively we treated Wednesday as we do a Friday, now which meant that most dinner rules could be bent. Wednesday dinners were usually a snack or a version of popular street food options like batate wade or the occasional burger. (Everything was home made, but, of course.) Those were great in themselves, because they offered a break from the usual weeknight staples of dal, fish or meat, chapatis and vegetables. But it was the desserts that we really looked forward to. The sweet tooth of our family is legendary and mum leads the brigade. She loves baking and making sweets and desserts of all kinds – from trifles and puddings to the more traditional laddoos, shrikhand and, of course, this kulfi. Aai, this one is for you. In a thick bottomed pan, pour the milk. Add the sugar and stir well. On medium high heat, boil the milk. Keep a watchful eye so that it doesn’t boil over. Stir frequently, scraping the sides down. This should take about 45 minutes. When the milk is almost reduced to half, take a tablespoon of it in a little bowl. Add the cornflour and mix well so that there are no lumps. Add this back to the milk and continue boiling till it turns a pinkish colour and is thick enough to coat the back of a spoon. Take it off the heat and let cool. To unmould, hold the moulds under warm running water and upturn them onto serving plates. I cooled the milk and poured into these paper cups. I then covered the cups with some parchment paper to make a lid (held together with a rubber band) and put the cups into the freezer. 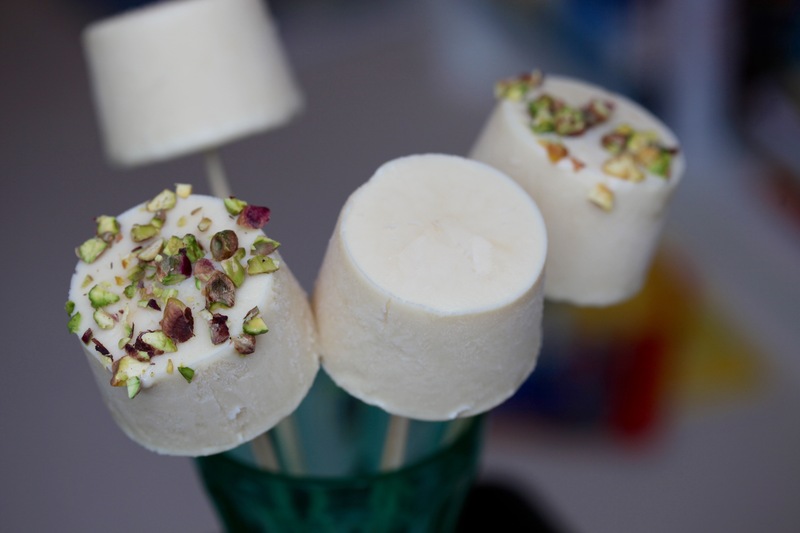 When the kulfi was half set, I pushed two skewers through each lid to make these kulfi sticks. This entry was posted in A-Z 2016, Desserts, Summer Food Fiesta and tagged #AtoZchallenge, epicurious, full fat milk, home made kulfi, indian kulfi, Indian sweets, kulfi, malai kulfi, milk desserts, Mumsnet Blogging Network, summer deserts, traditional kulfi, Yummly. Bookmark the permalink.